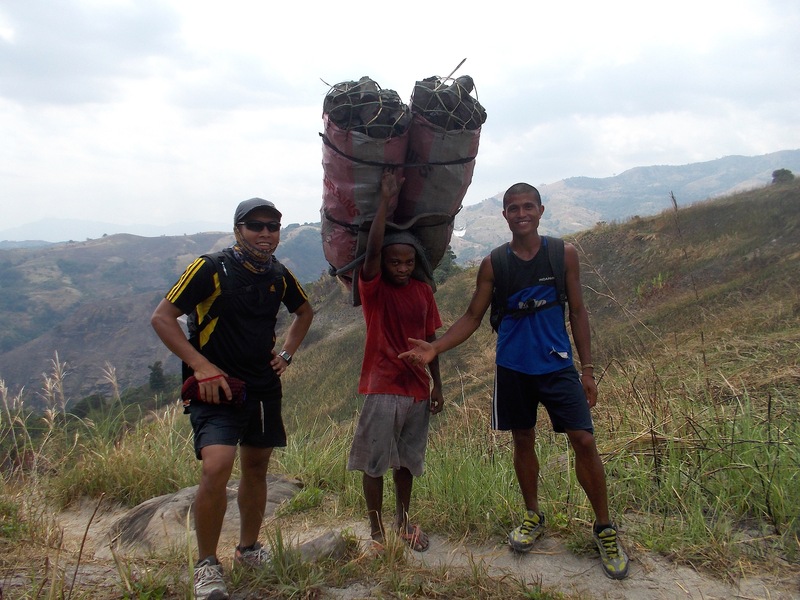 In one of my trail running adventures, I was able to meet Benson, an Aeta residing in a Resettlement who is trying to earn a living by making and transporting charcoal in the mountains of Bataan. I was on my way to discover trails within my backyard when I met him. I asked him to orient myself in the different trails in the mountains and he was glad to help me. I met Benson while he was on his way back to his residence in the Aeta Resettlement. He was carrying two sacks of charcoal which heights are taller than him. I can not believe how he was able to carry those sacks of charcoal with his thin and short body. What impressed me more was that he was using a rubber sandal walking/hiking on those mountain trails. His hiking pace was faster than me and my companion. He was really fast despite the fact that he was using a rubber sandal and carrying those two sacks of charcoal which are heavier than his weight. While we were in our pits stops and water resupply points, I find time to talk to him and was able to gather a lot of information about him. He is married to another lady Aeta who just gave birth to their first child two months ago. He burned his bamboo hut which he constructed in the Aeta Resettlement Area and he gave me a vague statement/answer on the reason why he burned his hut. Since he does not have a place of his own, his child and himself are staying in the hut of his mother-in-law. We asked some directions from him on how we can explore the mountains in the area and we asked the presence of mountain trails within the area. He is willing to be our “guide” if we intend to explore the nearby mountains and he asked that we should be in his place/resettlement area before 6:00 AM. In our pit stops, we shared our bottled water/drinks and bite foods. Upon reaching the resettlement area, he invited us to the hut of his mother-in-law and offered us a beehive full of pure honey. Instead, we offered him and the rest of the children in the hut with our Cloud 9 Chocolates and Pan De Sal (local bread). After about, 10 minutes of rest and changing his shirt, he offered his service to guide us to the road that leads to the main Highway. After hiking for 3 kilometers, he pointed a paved road that leads to a subdivision and gave some instructions and information about the description of the paved road. I brought out some cash in my hydration belt and I gave my money but before I can hand him my money, he asked not to be given such cash. He said that the money we have will be used for our fare for our tricycle and jeepney ride in going back to where we started. However, I asked and begged him to get the money for the milk of his baby and he gladly accepted it. From there, we left him as he walked back to the resettlement area. And for us, we still have 14 kilometers more of dirt and paved roads before we reached our final destination. One of these days, I and my training partner will be going back to get the service of Benson as our guide to the mountains in the area. I hope we can explore and measure another 30 kilometers along the mountain trails so that I can have a 100-mile mountain trail route in my playground.